“Something magical happens when prize-winning novelist Edwidge Danticat strings words together. From the most trivial details to breathtaking moments of enormous gravity, Danticat uses words as charms that gently beckon readers into her world and make them sigh, smile, laugh and weep. 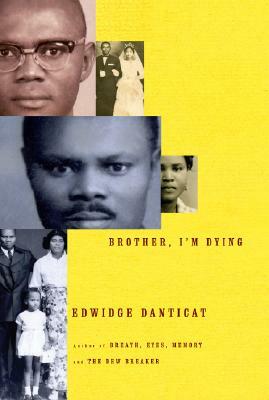 Crafted in Danticat’s signature precise, unflinching prose, her latest, Brother I’m Dying, is yet another revelation. In just three words, the title encompasses the memoir’s essence: It’s about family and it’s about death. Within those parameters, Danticat unfolds her heart-wrenching, intimate and true stories. "Taut, autobiographical and admirably reported, Brother, I'm Dying reminds us of truth's elemental force when unsentimentally and faithfully delivered. . . . If Brother, I'm Dying, does not break your heart, you don’t have one. It is not often that, a day after closing a book, one writes a review interrupted by tears, by lumps in the throat. Such are the aftershocks of the story Danticat tells." "The inimitable Edwidge Danticat has a new book out, a poignant memoir of her family's own diaspora between Haiti and the United States. . . . at once an account of one family’s generations and a reflection on leaving loved ones behind—a reckoning of the price that is paid by staying, and by leaving." "A fascinating memoir that traces the author's family history against the rich, turbulent backdrop of Haiti."